Module 1 Social Research The Social Research module will introduce you to the key social media concepts and equip you with the research tools and techniques needed to discover everything you need to know about your audience, competitors, cultural and industry trends. Module 2 Content Creation The Content Creation module equips you with the knowledge and skills to resource a content management function, to target your audience, select your platform and make use of social listening and competitor analysis. Module 3 Content Outreach You’ll be introduced to the concept of content seeding and how to use content effectively over multiple social platforms. You will acquire an understanding of how to promote content and the importance of paid promotion for relevant, highly shareable content. Module 4 Facebook The Facebook module provides you with a comprehensive understanding of how Facebook works as a platform for community building, content marketing and brand promotion. Module 5 Twitter This module equips you with the knowledge of how Twitter operates and the value it represents for businesses as a marketing and promotion platform. Module 6 LinkedIn The LinkedIn module gives you a comprehensive understanding of the benefits of using LinkedIn for marketing purposes. You will learn LinkedIn-specific features which will help you to facilitate campaign objectives. Module 7 Social Apps Going beyond basic features and vanity metrics, you will learn how to navigate app-based platforms; Instagram and Snapchat, and discover the features that can be leveraged to deliver real measurable results in unique, creative and interactive ways. Module 8 Social Video The Social Video module will introduce you to the concept of social video marketing. Focusing on YouTube, you will learn how to leverage the creative life cycle for audience development and advertising in order to build sustainable communities for lead generation. Module 9 Marketing Automation The Marketing Automation module aims to empower digital marketers to automate their marketing processes in the areas of lead management, lead generation, lead nurturing, sales enablement, social media marketing automation and customer evangelism. Module 10 Strategy & Planning Through the Strategy & Planning module you will learn how planning, researching, setting objectives, preparation, execution and learning are the key components of a successful social media strategy and ROI. Spread the cost! Ask us about our new financing options. Our global network of education partners is dedicated to prodiving high-quality digital education. Select your ideal partner to acquire a globally recognized professional qualification in digital marketing. 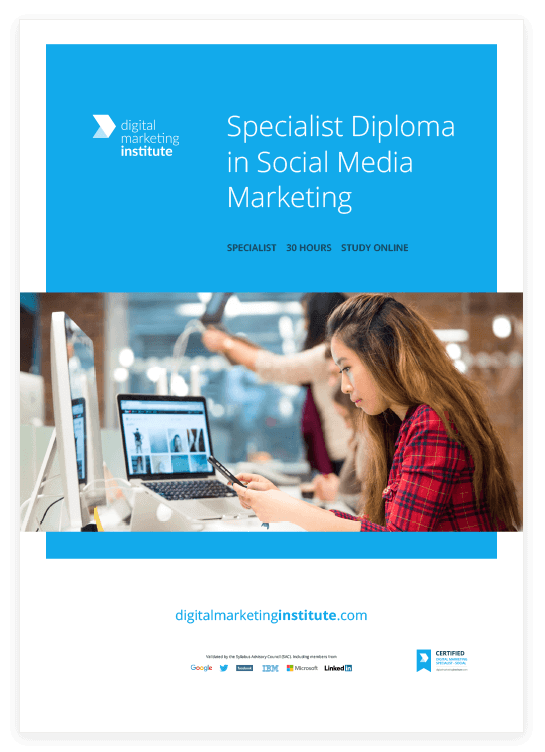 Do I need to have a digital marketing background?How much is the social media marketing course?Who should take this social media course?Where will my qualification be recognized?How is the social media marketing diploma assessed? Anyone can apply for the Specialist Certificate in Social Media Marketing. A background in a related discipline is not required – the aim of the Social Media Marketing Specialist Certificate is to allow you to learn everything you need to know about social media marketing; and to kick-start a new and exciting career. The 30 hour program teaches you everything you need to know to become a social media marketing expert. Each of our ten modules are taught by expert industry professionals, who will take you through the core social media specialisms and teach you the principles of effective social communication. How much is the social media marketing course? The Specialist Diploma in Social Media Marketing costs to study online. The fee includes all course content and the examination fee (first attempt only). In 2019, there will be 2.7 billion global social media users, making social networks the ideal platform to engage with and influence customers. This specialist course is perfect for social media lovers. It will help you understand how to develop and curate shareable content and introduce you to the importance of marketing automation, strategy and planning. Most importantly, it will explore the intricacies of key platforms such as Facebook, Twitter, Instagram and Linkedin along with social apps and social video. Becoming a Certified Social Media Marketing Professional will provide you with an in-depth understanding of how to strategize and implement effective social media campaigns. In just 30 hours, you will be ready to develop and implement a robust social media strategy that fosters trust and increases sales. Boost brand awareness with content that makes your users want to share, tweet and pin your path to social media success. The Content Creation module equips you with the knowledge and skills to resource a content management function, to target your audience, select your platform and make use of social listening and competitor analysis. You’ll be introduced to the concept of content seeding and how to use content effectively over multiple social platforms. You will acquire an understanding of how to promote content and the importance of paid promotion for relevant, highly sharable content. The Social Video module will introduce you to the concept of social video marketing. Focussing on YouTube, you will learn how to leverage the creative life cycle for audience development and advertising in order to build sustainable communities for lead generation. Become a Certified Social Media Marketing Professional on completing this exam. Social Media is a crucial part of any digital marketing strategy as it helps promote brand awareness, build trust and increase sales. This professional certification is designed to help you become the best social media marketer you can be! Who is this Specialist Certification for? Boost your credibility, improve your knowledge and ensure customers share, tweet and pin your path to social media success. Now with new financing options.